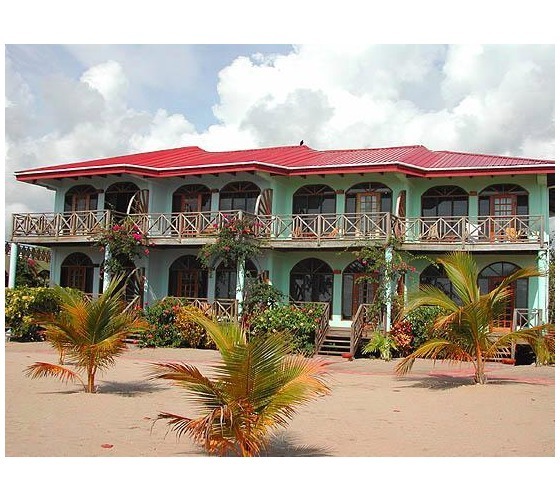 Hamanasi Adventure & Dive Resort "Our Belize Vacation" - "Our Belize Vacation"
Nestled between the lush Maya Mountains and the turquoise Caribbean Sea, Hamanasi is a special place from which you can explore the best of Belize on and offshore. 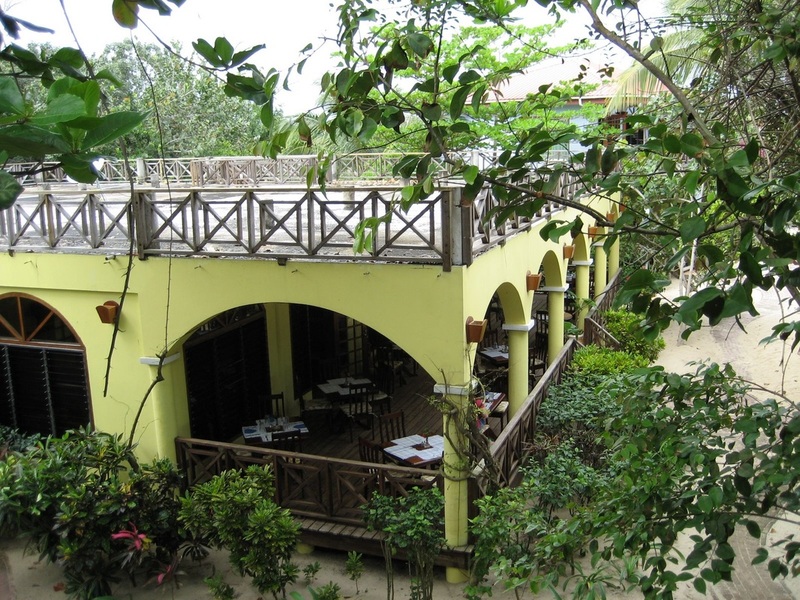 A secluded, intimate boutique resort located on the beach south of Hopkins, Hamanasi sits on hundreds of feet of Caribbean Sea beachfront surrounded by tropical flora on the finest stretch of beach in Belize. With a short flight from Atlanta, Charlotte, Dallas, Houston, Miami, New York or San Salvador you may let the warm tropical breezes melt away your hectic life for the laid back pace of Belize! 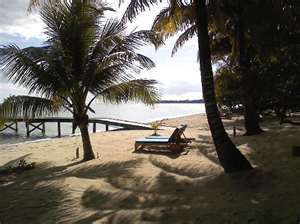 Your daily adventures will begin and end in the casual elegance of Hamanasi Dive & Adventure Resort. 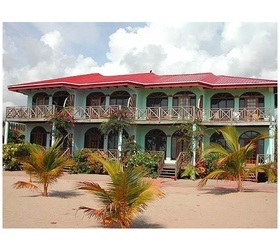 You'll be able to kick back and soak in the ocean air in our Great House or by the pool. 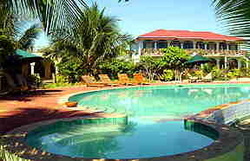 If you fancy you may take a swim in the warm Caribbean waters or enjoy a tropical cocktail at the bar. 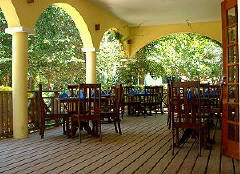 Our friendly staff will greet you with warm smiles and attentive service. 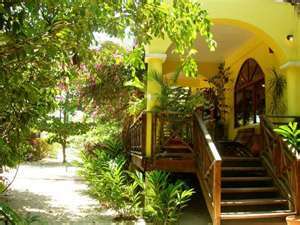 Of course, Hamanasi's Adventure Center, housing our dive & snorkel center will service you on premises. 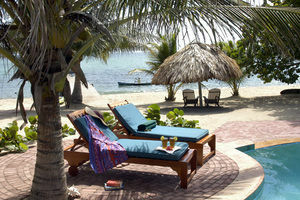 We offer an exceptional, all around Belize resort! 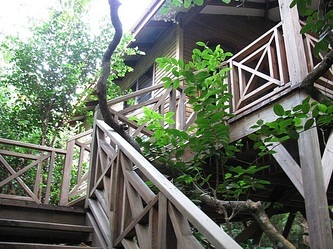 Tucked into its coastal littoral forest is Hamanasi’s newest unit, the Deluxe Treehouse. 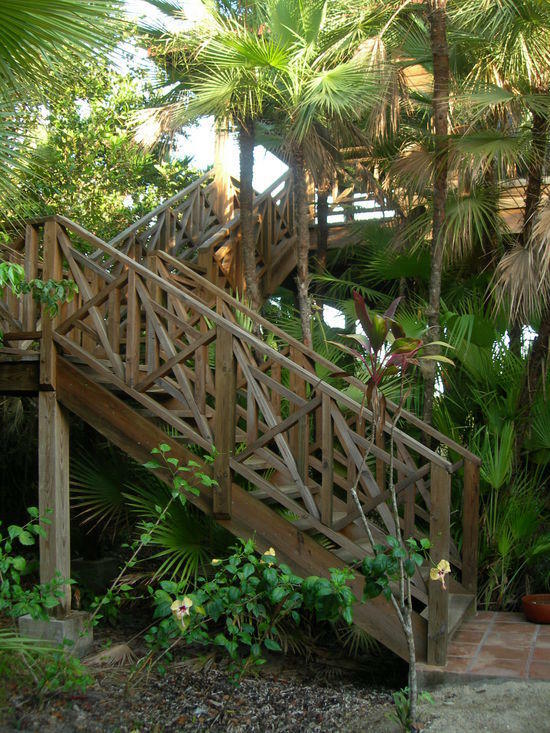 Named “Black Orchid” after the Belizean national flower which graces the paths, the Deluxe Treehouse enjoys a spacious living room in cool tropical tones furnished with handcrafted Belizean furniture and local art. 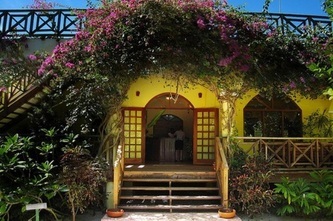 Adjoining is a large, charming kitchenette with a dining table, stocked mini bar, coffee maker and bottled water. Bold blue tiles adorn the commodious bathroom, which boasts double vanities, plenty of storage space and his and her robes. 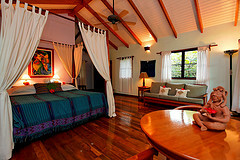 Guests enjoy views of the tropical vegetation through the expansive window in the huge shower/tub with twin showerheads. 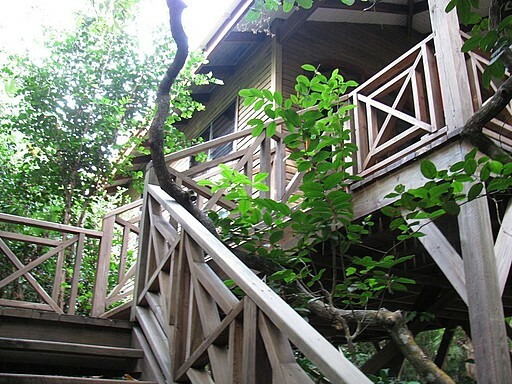 This treehouse also features a wrap-around veranda with jacuzzi. Bedding: 1 king bed and a futon. Our two spacious Honeymoon Suites are 17 X 28 feet plus an 8-foot porch overlooking the beach. 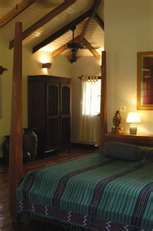 Bedrooms have romantically draped four-pollster king size beds made of barba jolote wood. 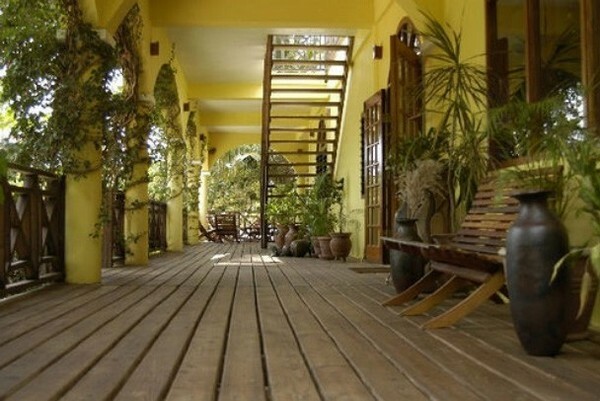 The bedrooms open into a large front room complete with a comfortable sitting area and a dining table and chairs. 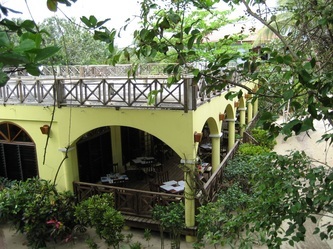 Walls are painted in cool, tropical tones and have vaulted ceilings with exposed barbe jolote beams. 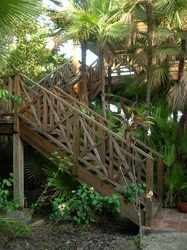 Porches boasting views of the ocean and lush foliage have mixed hardwood deck chairs and cozy hammocks. These rooms have coffee makers, I-Homes, ironing boards and robes. 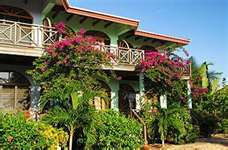 For a honeymoon in Belize, or just a romantic getaway, with so much space, comfort and romance, you’ll never want to leave! 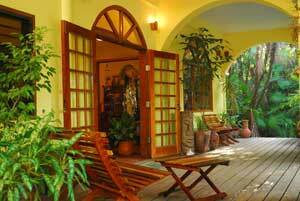 Our most popular rooms, these spacious, individual cabanas provide the utmost in privacy. 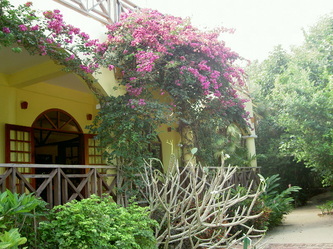 Each unit is raised 12-feet and is surrounded by a variety of trees, orchids and birds. The treehouse size is 17 X 26 feet plus an 8-foot porch. Four treehouses feature stately king-size beds made of the hardwood barba jalote. 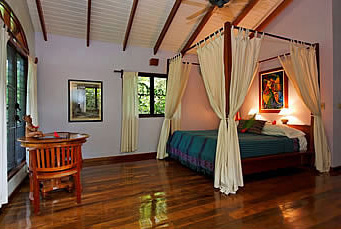 Two rooms have 2 mahogany queen beds. 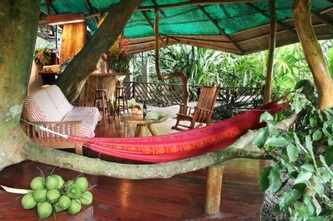 All treehouses have air conditioning, louvered windows, ceiling fans, hardwood floors and full size futon couches. The bathrooms are spacious and have double vanities and a shower with a 5-foot window and skylight. 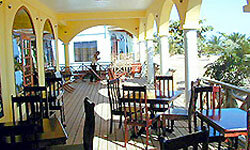 Porches have comfortable mixed hard wood clam chairs, a table and hammock. The primary attraction of the treehouses is privacy. 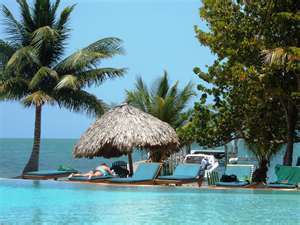 Each cabana is freestanding without a room above, below or directly beside it. Because of the surrounding trees you may see up close a plethora of birds. 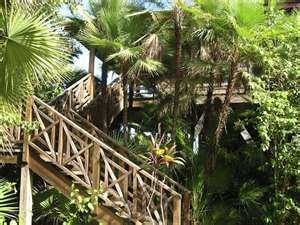 Our guest, Sharon put this video of her treehouse on YouTube. The video is dark but she gives you a great feeling for her excitement about the room. Bedding: 1 king bed and a futon or 2 queen beds with a futon. Traveling with kids? A group of friends on vacation? 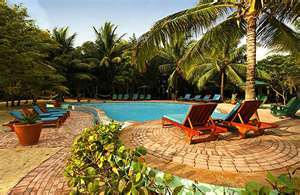 Our commodious beachfront deluxe rooms are an ideal solution for those wishing to share a room. 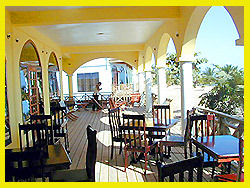 The beachfront deluxe rooms are 17 X 28 Feet plus an 8-foot porch. 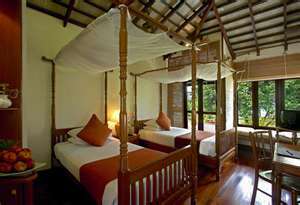 One room has a mahogany king size bed and a table and chairs. In a separate room there are two twin beds. Both rooms have their own entrance to the shared bathroom. Bedding: 1 king bed and 2 twin beds. 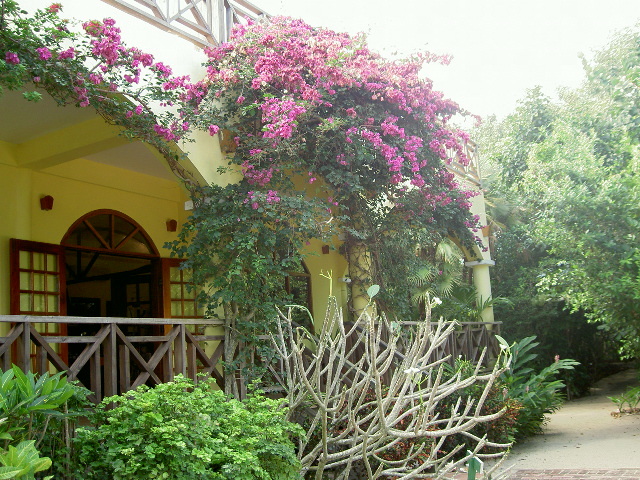 Our beachfront rooms boast magnificent sea views and plenty of space. 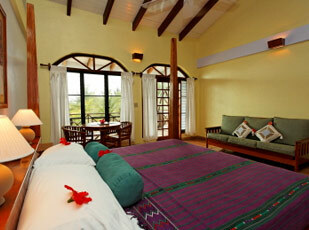 These rooms have either a king size bed or two queen beds made of Belizean hardwoods. Additionally, all rooms have a futon couch that can pull out into a full size bed. Our louvered windows will allow you to enjoy the refreshing ocean breeze. These rooms are 16 X 24 feet plus an 8-foot porch. 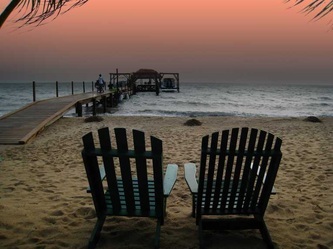 You’ll enjoy sunrise and sunset from our Beachfront Rooms!